What are our two favorite St. Augustine attractions? A tour of a famous chocolate factory and a free wine tasting at an acclaimed winery! St. Augustine was a big surprise for us, and in a very good way! We’ve been there twice now and we plan on going again because for a relatively small city, there is a lot to do. There are plenty of free things to do in St. Augustine (including wine tasting tours) and relatively inexpensive attractions as well (like a Whetstone Chocolate tour). St. Augustine is known as the “Nation’s Oldest City” because it is the oldest continuously occupied European settlement in North America. Needless to say, this place is a history buff’s paradise. Juan Ponce de Leon first explored this area in 1513 while on his quest to find the legendary Fountain of Youth. The city was founded in 1565 and was ruled by both the Spanish and the British before eventually becoming an American territory. It doesn’t take much to feel like you’ve gone back in time once you arrive in the city. Spend some time at the more popular St. Augustine attractions like the Castillo de San Marcos and the Fountain of Youth Archaeological Park, or take a walk down St. George Street. Everywhere you turn there are people dressed up and giving live demonstrations of what it was like to live in St. Augustine hundreds of years ago. Even the Pirate and Treasure Museum gives a lot of insight into the history of piracy in Colonial America, with both interactive technology and over 800 museum-quality artifacts. And what do you do once you feel like a seasoned explorer, adventurer, or pirate? You head over to Whetstone Chocolate Factory for a chocolate tour and then next door to the famous St. Augustine winery, San Sebastian! If you love chocolate, stopping at the Whetstone Chocolate Factory is a must! There are guided tours seven days a week that explain the history of the company, as well as anything and everything you could ever want to know about chocolate. We were able to taste milk, dark, and white chocolate samples and were given a tour of the factory itself, all while wearing very stylish hair nets! Look at that St. Augustine chocolate! Pro Tip: If you love chocolate, visit Hershey’s Chocolate World in Pennsylvania! Once you’ve taken care of your chocolate fix, head next door to San Sebastian Winery. They have FREE wine tasting tours! This winery has been open since 1996, has won over 300 awards for excellence, and is visited every year by over 100,000 people. We felt silly because we hadn’t even known you could do wine tasting in St. Augustine! Even if you’re not a wine aficionado, the San Sebastian tours are great because you can learn a bit more about the process of wine-making and the different kinds that there are. We tend to stick with white wines, but it was nice to be able to try samples of their reds as well, especially for free. In addition, San Sebastian also has live music on weekends at “The Cellar Upstairs” which is on the rooftop of the winery. Fun Fact: There are also great wineries in Central Florida! 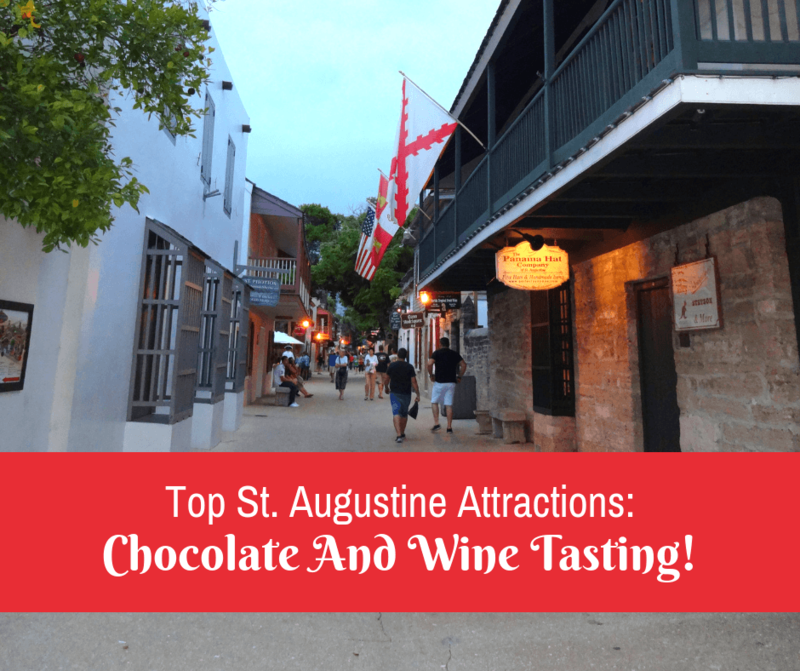 So if you’re wondering what to do in St. Augustine, we recommend eating chocolate and drinking wine! Of course, take advantage of some of the other St. Augustine attractions like the fort and museums, but definitely indulge in some St. Augustine wines and St. Augustine chocolate. I remember that place too! Lol. Great blog! It was a very interesting & fun little trip. I loved making the 2 hour drive to St. Augustine from Gainesville. My favorite stop was at Vino Del Grotto and to try the fruit wines there. I miss always having a bottle of Kiwi wine hidden away. Chocolate and wine! Sign me up. You’ve combined 2 of my favorite things – chocolate and wine! Glad you enjoyed it Dana! Yes, Castillo, Fountain of Youth and St. George St. are musts. But this chocolate and wine fix I missed! Thanks for an enjoyable read! I’m glad you liked it Carol! Haha! It was pretty awesome! Where abouts is St Augustine? I can’t see it anywhere in your post! Looks like a nice wee town though. Sorry about that Bethaney, it’s in northern Florida. Seems that you guys were in paradise!! History + Culture + Chocolate + Wine = Heaven!! Need to put St. Augustine on my travel list, you have convinced me! You had us at chocolate. Oh, and wine! 🙂 Looks like a great time!